I'm very proud to have my short story "Don" in the June edition of Andromeda Spaceways. The original version of the story was drafted almost three years ago, and was inspired by the research I did into wind energy generation as a high school debate coach, as well as my lifelong fondness for the Broadway musical "Man of La Mancha". The story retells Don Quixote as the story of a rogue climatologist, and offers a sci-fi take on his struggle against the windmills. It was a fun story to write. Any author learns to love the moment at which they find themselves in possession of a wholly original idea--those visits from the muse are few and far between, and inspire a white-hot burst of writing energy as one pours the idea out onto paper. So the story emerged, and was revised, and revised again, and submitted, and submitted again, as stories are. I never doubted it would land somewhere; the idea was just too much fun not to see print. This provoked no small amount of disappointment in me (NOOOOO! MY ORIGINAL IDEAAAAA!!!) as well as a mini-crisis of conscience. Because my inspirations for the story, and my research into its plot points, were exactly as I said. 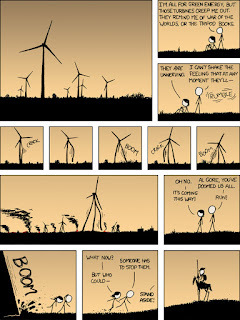 But, on the other hand...I do read XKCD on occasion. And this strip tracks the plot of the story pretty closely. While I had no specific recollection of reading this particular strip, it seems very likely to me that it influenced me when I wrote the story, at least at a subconscious level. Which raises the question: is it possible to be a plagiarist without intending to be one? I've served as a reviewer of other people's stories at a couple of sites, and I occasionally run across examples of plot points or even character names which I've run into previously in mass-market fiction. I'm not talking about Tolkein pastiches, so much; I'm referring more to things like referring to your main character as "the Bloodless," ala Patrick Rothfuss. And researching the issue, I discovered it happens to professional authors fairly frequently--and that some of them go so far as to avoid reading within their genre for fear of "idea contamination." I have, in the past, re-read an old favorite only to find a section of text that's suspiciously close to something I've written myself--I've inadvertently taken copy from Douglas Adams, Terry Pratchett, Harry Turtledove, and others. Whenever I've come across an instance of this, I've removed the relevant text from my own work. Using another author's words, intentionally or unintentionally, is plagiarism, full stop. Story and plot concepts fall into a more ambiguous space. For instance: both my YA novel Axis of Eternity and my short story "Monsters in Heaven" involve an extraplanetary afterlife not altogether dissimilar to the one Phillip Jose Farmer explored in his Riverworld novels. AoE also involves a plot concept which had been previously explored by Ivan Stang, inventor of the Church of the SubGenius, and which I later discovered as the central concept of still another author's story in Broadswords and Blasters. Where this sort of thing is concerned, I think some allowance has to be made for good faith on the part of the author, provided that he or she is acknowledging his or her influences and giving credit where it's due. And there's also going to be some instances of two different people just having the same idea. Great minds think alike, and occasionally, even my mind meanders into those realms normally reserved for the truly talented. In the end, I elected not to kill the story, and the editors, having been made aware of the issue, elected not to kill it either. 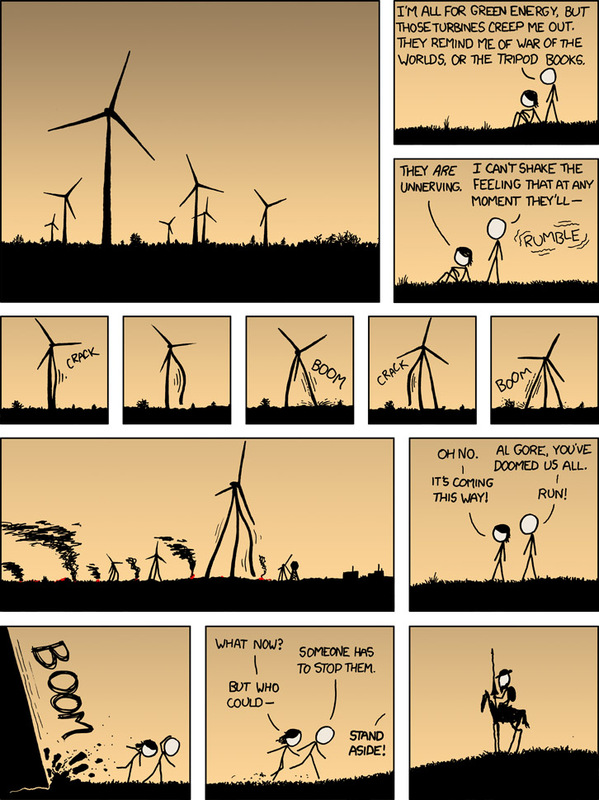 I do think, though, that it's appropriate to give xkcd's Randall Patrick Munroe a shout-out and a thank you for his subliminal inspiration. His stuff is so great that it ends up making my stuff better. And if he's reading this, I hope he won't have me killed.